Each ml contains sodium cromoglicate 20 mg, fluoromethotone 1.0 mg, benzalkonium chloride 0.1 mg (as preservative). Fluorometholone inhibits the inflammatory response to inciting agents caused by alergic conjunctivitis s0dium cromoglicate innibits the release of certain physiological mediators from sensitized mast cells. – Acute superficial herpes simplex keratitis. – Fungal diseases of ocular structures. 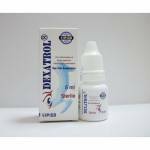 – Vaccinia, varicella and most other viral diseases of the cornea and conjunctiva. – Tuberculosis of the eye. – Hypersensitivity to the constituents of this medication. Steroid medication in the treatment of herpes simplex keratitis (involing the stroma) requries great caution; frequent slit-lamp microscopy is mandatory. this product and not re-inserted earlier than 15 minutes after use. This product contains a corticosteroid, its use should not exceed two weeks to maximum four weeks. Safety of the use of topical steroids during pregnancy has not been established. As fungal infectioris of the cornea are particularly prone to develop coincidentally with long-term local steroid applications, fungus invasion must be suspected in any persistent corneal ulceration where a steroid has been used or is in use. Intraocular pressure should be checked frequently. Glaucoma with optic nerve damage, visual acuity or field defects, posterior subcapsular cataract formation, secondary ocular infection from pathogens liberated from ocular tissues. perforation of the globe. Transient stinging and burning. One to two drops of Fluca?’ ophthalmic suspension is instilled in affected eye(s)-4 tlmes-a-day-or according to your physician’s instruction. Don’t discontinue therapy prematurely. In chronic conditions, withdraw treatment by gradually decreasing the frequency of applications. Fluca'” sterile ophthalmic suspension, 5 ml in LOPE bottle. Store between 15°C – 25°C, protect from freezing. Shake well before use. keep out of the reach of children. Discard the bottle after 30 days of opening. – Medicament is a product that affects your health, and its consumption contrary to instructions is dangerous for you. instructions of the pharmacist who sold the medicament. – The doctor andihe pharmacist are experts in. medicine, its benefits and risks. – Do not by yourself interrupt the period of treatment prescribed. – Keep medicament out of reach of children.